Greetings! I hope that you are enjoying the fall colors wherever you may live as much as we are here in Santa Fe, where the aspens are peaking right now. 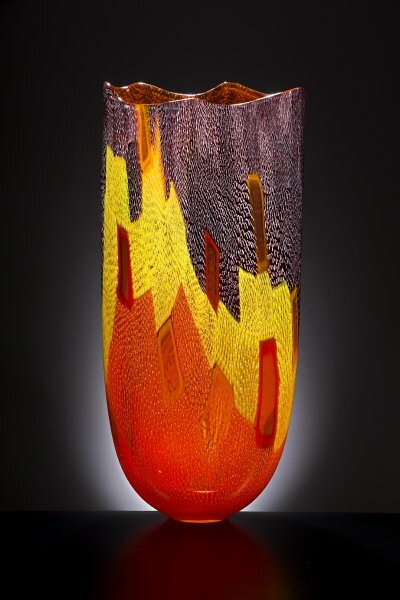 Speaking of color, I believe that one of the qualities of contemporary glass art that we all love is the multitude of colors that can be used. 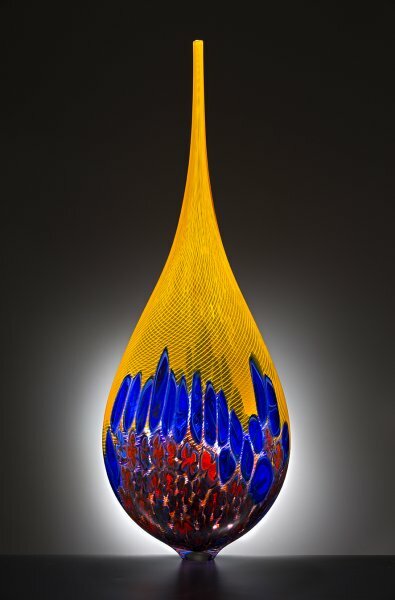 It was Dale Chihuly who said that he never met a color he did not like. This month, I have lots of colorful new work to share with you. I hope you enjoy the view! 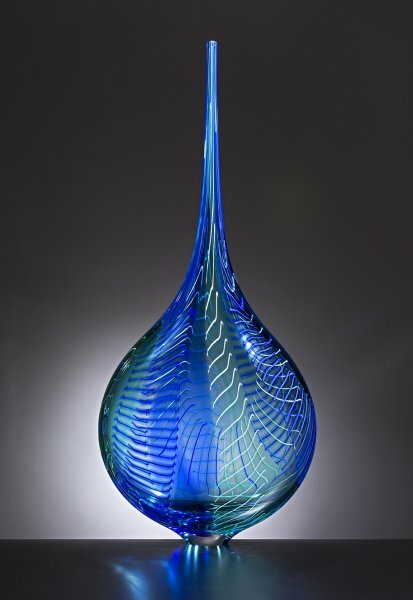 "Lino Tagliapietra is perhaps the world’s greatest living glassblower." New Lino Tagliapietra Inventory (Part I)! I have just chosen 8 new pieces by the maestro. Here are a few of them and the rest can be seen by clicking here. This is part I of my entirely new Lino inventory. I look forward to choosing the other works in early November when I visit Lino in Seattle. Lino’s "Fuji" series has in recent years become one of my favorites. I’ve always loved the forms but initially the colors in this series were less bold and painterly. 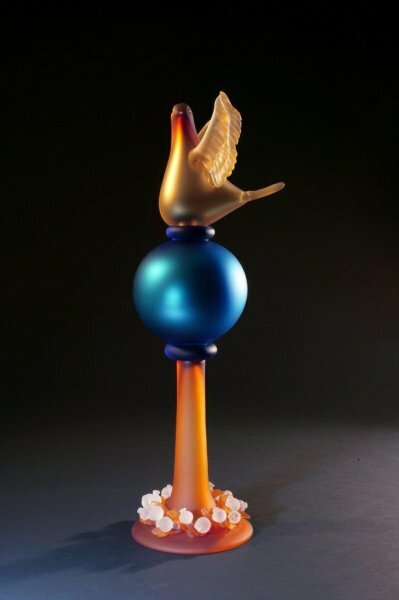 I particularly like the subtle white cane work in the top portion of this beautiful piece. What a wonderful new piece! The use of the murini is so understated, as are the colors. I would say that this is one of most transparent pieces I have ever seen by Lino, as the amount of clear glass far exceeds the color. This is the first piece that I chose for my new inventory! In stark contrast with "Contarini," this handsome "Stromboli" is full of fire, like its namesake island off the coast of Sicily which contains one of Italy’s three active volcanoes. This elegant piece is a masterful study in shades of blues. The cane work is both complex and quite subtle. The neck of this example of Lino’s well known "Angel Tear" series is less exaggerated than most and therefore this piece could easily be mistaken for some other series. This piece is classic Martin Rosol. Beautiful in its simplicity, understated in its strong presence, dramatic in its own quiet way. 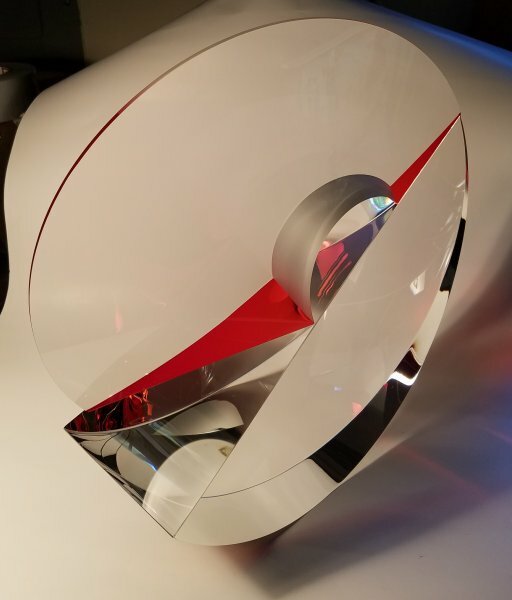 What does not show in the image is the fact that the bit of red color between the two clear sections changes from each angle, sometimes almost disappearing and other times flooding a section of the clear with color. This piece makes me smile. It is elegant, playful and exceptionally well crafted. To me the feeling of this piece is one of joyful exuberance. Just yesterday I received this beautiful new John Kiley piece. I love the sculptural lines here. The subtle colors give his new work a tranquil, centered quality. 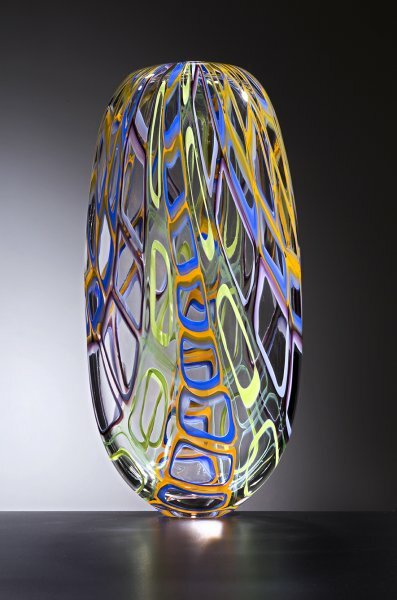 Thank you for spending part of your day enjoying some great glass art! As always, if you have any questions, comments or need further information please don’t hesitate to be in touch.